This program is ideal for those who organize weekly team golf games of 8 or more members. It greatly reduces the time you spend organizing your group, through a member calendar system that eliminates the need for spreadsheets, napkin notes and multiple phone calls. It is feature rich, easy to use and only costs $10 per member per year. If you would like use GolfCaptains for your annual golf getaway with your buddies, then we have a deal for you. You may use GolfCaptains for three weeks for only $5 per member. "Hi, my name is Len Doucette and I am one of the Commissioners at the Pinehills Men's Golf League. We have been members of GolfCaptains for eight years now and we play in Plymouth Ma. on the Jones course and the Nicklaus course. We have 74 members and a complicated league because we play 3 times a week. We run games from April through November for a total of 103 play days. We also have multiple tee competition between white tee and silver tee players and need to adjust the handicaps for that. We find GolfCaptains to be very flexible for our needs. They are always making enhancements to their system for us and to keep up with the competition. Occasionally, I find a bug or two, notify GolfCaptains and get an immediate response. 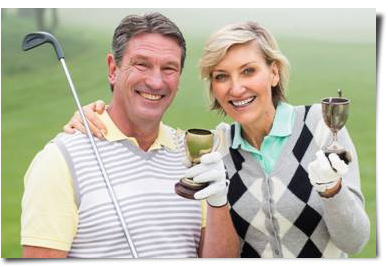 I would recommend GolfCaptains to any group. Sincerely, Len Doucette." if they are the Captain of their group for the week. "I've been a golf captain for a large group of golffers for the last seven years in Naples Florida"
GolfCaptains will calculate and display member handicaps for up to three tee boxes for each course you play.